Virginia Secretary of Education Anne Holton joins 130 students at the Virginia Campus’s annual event. 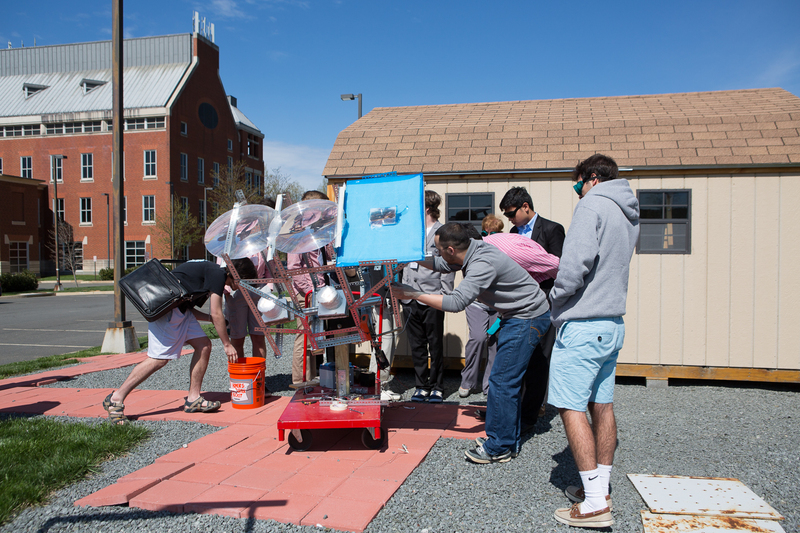 Students from Loudoun County Public Schools build a projectile launcher during a workshop titled, "Flight of the Ping Pong Ball," led by Assistant Professor Megan Leftwich and graduate student Danielle Barsky. Loudoun County Public Schools students took cover as dozens of ping pong balls were catapulted across an Enterprise Hall classroom on Thursday afternoon. On the other side of the room, three Stone Bridge High School juniors—Sean Kim, Isaac Sheikh and Henry Tuner—were measuring the distance and speed at which their ping pong ball had traveled in order to determine their vehicle’s launch velocity. The students had spent the first half of the workshop learning the physics of projectile motion, and then they put their knowledge into practice. “There is a lot of science behind your average sling shot,” said Mr. Kim, who has hopes of one day becoming a mechanical engineer or a math teacher. The students were participating in one of the 12 workshops at the eighth annual Science, Technology and Engineering (STE) Day at the George Washington University Virginia Science and Technology Campus (VSTC). The campus hosted 130 students from 11 Loudoun County high schools, who were chosen by their teachers because of their interest and achievements in the applied sciences. The VSTC campus also welcomed Virginia Secretary of Education Anne Holton on Thursday, as she attended a student workshop and spoke to the students on the importance of science, technology and engineering education. Throughout the day, the students had the freedom to attend the three workshops that best matched their interests. 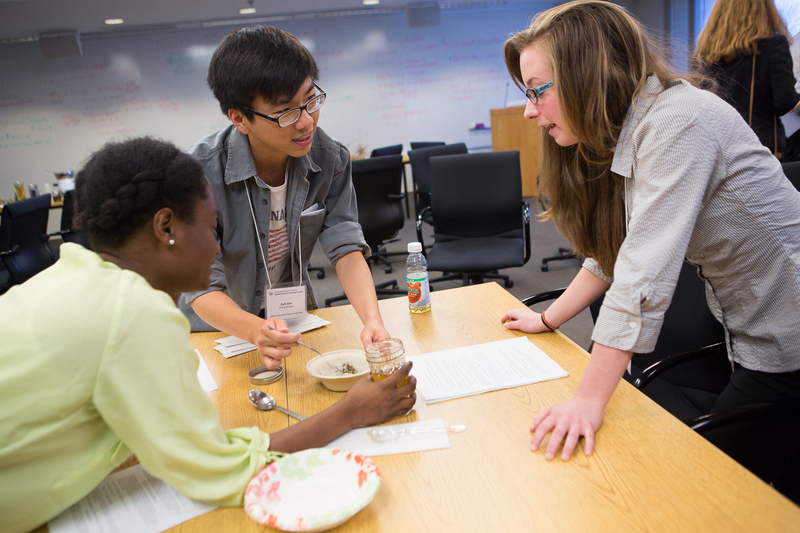 The hands-on experiments and demonstrations, which were developed and taught by GW faculty and graduate students from across university departments, were intended to introduce the students to potential career paths. High school students learn about a new solar energy process that efficiently removes carbon from the atmosphere and generates the staples needed by society in a workshop led by Stuart Licht, a professor in the Columbian College of Arts and Sciences' Department of Chemistry. 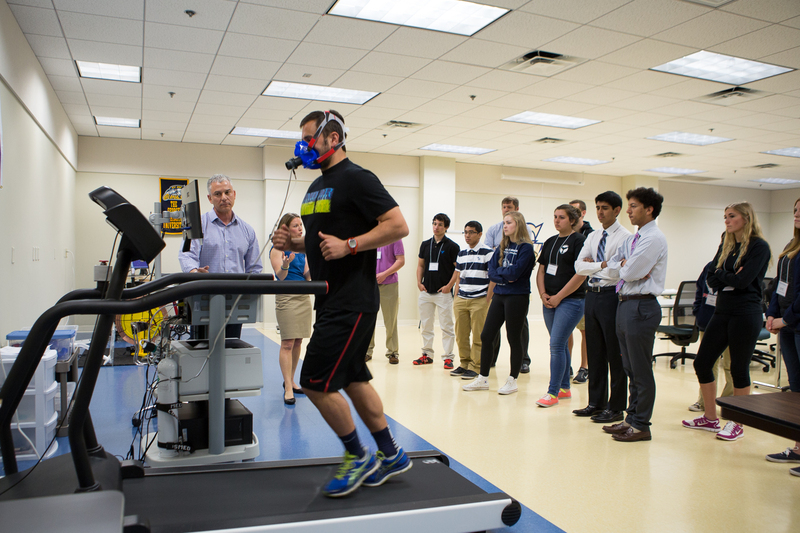 Todd Miller, an associate professor in the Department of Exercise Science, teaches students the science that goes into training an elite athlete. 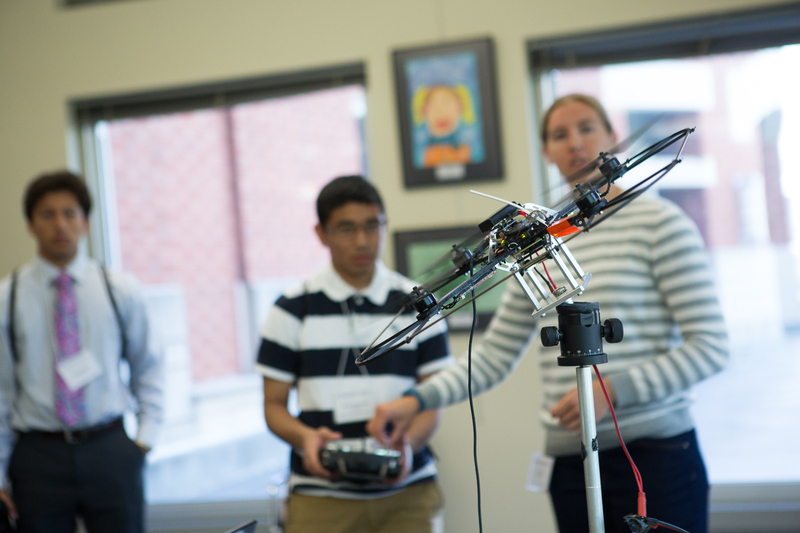 In a workshop presented by the Department of Mechanical and Aerospace Engineering, students had the opportunity to maneuver this quadrotor over a given trajectory and test its response rate. 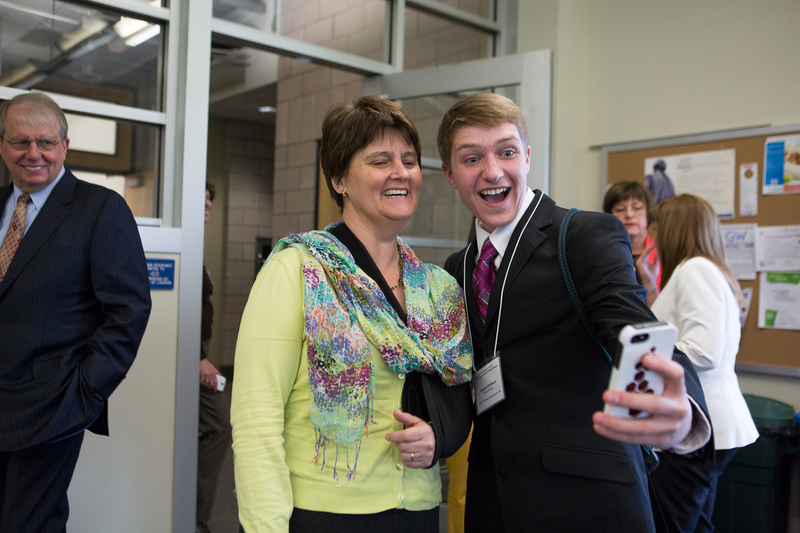 A student takes a selfie with Virginia Secretary of Education Anne Holton, who visited the Virginia Science and Technology Campus on Thursday. The future scientists, engineers and tech gurus had a taste of a wide range of potential careers and research areas: Some test drove an instrumented vehicle designed to increase a driver’s responsiveness and reduce accidents. Others used sophisticated equipment to perform check-ups on computer-controlled “patients” in the GW School of Nursing Skills and Simulation Laboratory. And some students learned techniques in DNA fingerprinting, sequencing and genetic analysis. Mid-afternoon Ms. Holton, whose son is a 2012 graduate of GW, joined the students at VSTC. Ms. Holton said Virginia Gov. Terry McAuliffe believes the higher education system is the “key to economic development.” And one of her priorities as secretary of education is to help connect Virginia high school students to higher education and then into the job market. She said young people often have fairly little exposure to the career options that are available to them. 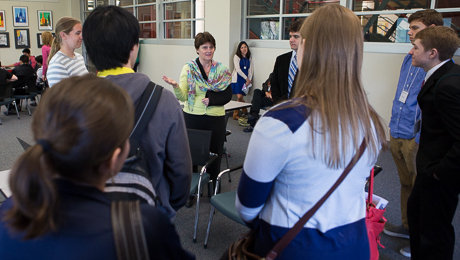 Virginia Secretary of Education Anne Holton visits a classroom in Exploration Hall, where high school students are learning about quadrotor dynamics and flight—a workshop led by the Department of Mechanical and Aerospace Engineering in the School of Engineering and Applied Science. Ms. Holton stopped into a classroom in Exploration Hall where Assistant Professor of Engineering and Applied Science Adam Wickenheiser and his graduate students were showing the high school students how to test their control strategies on a quadrotor, a type of micro-air vehicle that is popular in unmanned aerial vehicle (UAV) research. Ms. Holton took hold of the controller and the students cheered her on as she maneuvered the four-rotor helicopter around in a circle, seeing how sensitive the system was. Following Ms. Holton’s remarks, Dan Sawyer, a mechanical engineer who works for the U.S. Commerce Department’s National Institute of Standards and Technology (NIST), gave a keynote address. In his role at the NIST, Mr. Sawyer works in a laboratory that helps to develop the most sensitive and reliable measurement tools. After lunch, some students had the opportunity to watch athletes burn off calories with Todd Miller, an associate professor in the Milken Institute School of Public Health’s Department of Exercise Science. After lecturing on topics like body composition and oxygen intake, Dr. Miller ran a lifelong field hockey player through a series of advanced tests, showing how rigorous testing ensures elite athletes’ bodies are functioning at the highest level. He also introduced the students to the Dual-energy X-ray Absorptiometry scan, also known as DEXA, which is often considered the gold standard for body composition assessment. The DEXA scan uses a low-dose X-ray to determine body fat percentage, an overall bone mineral density score as well as fat and fat-free mass in specific regions of the body. Dr. Miller said he hopes that his workshop sheds light on how athletes can, and should, be trained with science. For Mr. Kim, STE Day was not only a chance to gain insight into careers and scientific fields he never knew existed, but it also gave him the chance to build relationships with other local high school students who share his interests.